The Peralta District Colleges are in the process of upgrading our computer information systems. All online services associated with this PeopleSoft upgrade will be unavailable starting at 5:00 P.M. on Friday, February 21, 2014 and ending at 6 A.M. on Monday, ending February 24, 2014. 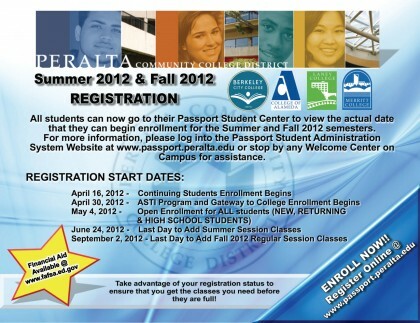 Passport, PROMT, Admissions and Records registration services, Counseling computer functions, and all payment systems will be unavailable. This upgrade to PeopleSoft is necessary to improve our information services and to make your experience easier and more efficient. Services will resume Monday, February 24, 2014 at 6:00 A.M. We appreciate your patience. If you have any questions regarding the upgrade, please contact the IT helpdesk at (510) 587-7800 or email us at helpdesk@peralta.edu. The Peralta District Colleges are in the process of implementing the most recent tax updates to our information systems. All online services associated with this PeopleSoft enhancement will be unavailable for approximately one (1) hour on Friday, October 11, 2013 from 7pm-8pm. Passport, PROMT, Admissions & Records services, Counseling computer functions, and all payment systems will be unavailable. This Tax update is necessary to keep current and compliant with Federal and State regulations. Services will resume after 8pm, the same day, Friday, October 11, 2013. We appreciate your patience. 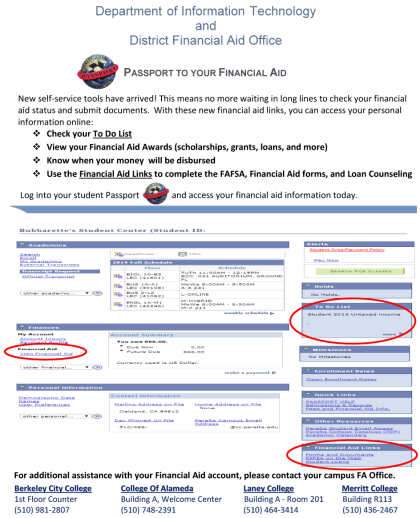 If you have any questions regarding the scheduled outage for Tax Update 13d, please contact the IT helpdesk at (510) 587-7800 or email us at helpdesk@peralta.edu. For more details, please visit the District IT page, click here now!